Legend of Sikelgaita saving Robert’s life sucking venom from a poison arrow wound as prescribed by doctors of Schola Medica Salernitana Salerno, Mid 15th century CE © University Library of Bologna, Canon of Avicenna, folio 317v. Daughter of Guaimar IV, Prince of Salerno, wife to Robert Guiscard d’Hauteville, Duke of Apulia. Sikelgaita was the last Lombard princess and the most privileged woman in the Duchy. She spent much of her time studying medicine at the local medical school in Salerno, a school unique to Europe where disease became something to be diagnosed, treated and potentially cured, ultimately leading to the "scientific" approach. While it’s believed her marriage to Robert Guiscard was arranged she agreed realizing a union between the Normans and Lombards could enable them to rule much of Italy. Sikelgaita is described as a woman of immense build and colossal physical strength, proving to be the perfect wife for Robert, scarcely ever leaving her husband’s side—a close political aide and in battle equal in courage to both her husband and step-son who were named as the two outstanding warriors of their age. In 1080, while Robert moved against Taranto, Sikelgaita conducted a successful siege of Trani, a well-fortified city that had been given to Peter I by her father Guimar in 1042. In 1081, after initially trying to dissuade Robert and his Norman forces from attacking the Byzantine Empire led by Emperor Alexius I Comnenus Sikelgaita appeared on the battlefield, fully armed and mailed, positioned on his left inland flank ready for battle. According to Byzantine historian Anna Comnena, “Gaita” saved the day, a second Pallas, if not an Anthene, when Sikelgaita saw soldiers running away she demanding fiercely, in her very powerful voice, how far will you flee? Stand and fight like men. When they continued to run she grasped a long spear and at full gallop rushed after the fugitives, on seeing this they recovered themselves and returned to fight. As the Byzantine army disintegrated fleeting into the field, the Norman pursuit was half-hearted once they discovered the Byzantine camp contained supplies and a portion of the royal treasury . The battle of Dyrrhachium had ended, a heavy defeat for Alexios with large casualties on both sides. During this same period of time, Robert and Sikelgaita met with Pope Gregory VII who, after excommunicating Robert in 1074, welcomed him back into the community of the faithful in exchange for Guiscard’s promise to be the vassal of the church, defending it against German foes, specifically Henry IV, Holy Roman Emperor. In 1084, Sikelgaita joined her husband again on the battlefields of Greece where they immediately meet and defeated a combined Venetian-Byzantine fleet in a ferocious encounter, taking the island of Corfu and then Kefalonia. In July 1095, after the battle of Kefalonia Robert took ill and died quickly with Sikelgaita by his side. She arranged to have his remains returned to Italy to rest in the Hauteville crypt in the Cathedral of Venosa in Puglia. 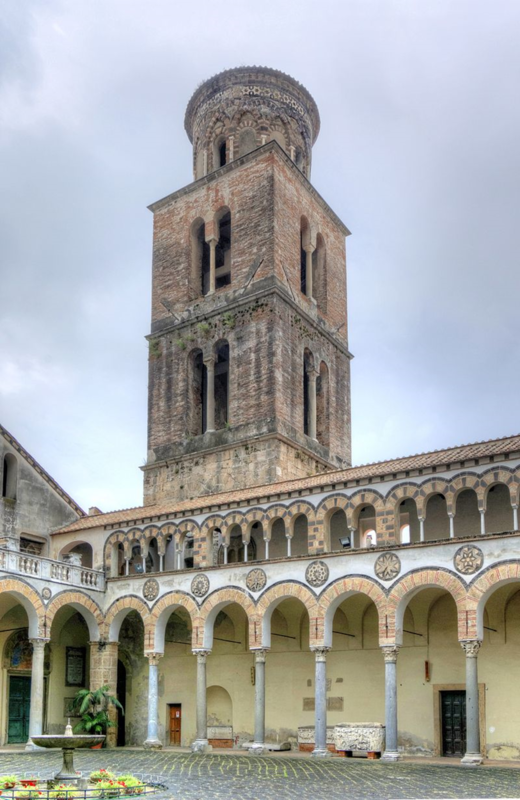 From 1085-1088 she was regent Dowager Duchess spending much of time in religious seclusion in the Abbey of Montecassino, a place to which she held in a lifelong bond and devotion and at her death in 1190 requested to be buried there. Salerno, Cathedral Church of Matthew the Apostle, Bell Tower, begun by Robert Guiscard 1076 CE, consecrated by Pope Gregory VII 1084 CE, site of Pope Gregory’s tomb © Bethold Werner CC BY-SA 3.0. DeVries, Kelly and Clifford J. Rogers, editors. The Journal of Medieval Military History, volume 3. Boydell Press, 2005. Norwich, John Julius. The Kingdom in the Sun, 1130-1194. Harper & Row Publishers, 2011. Norwich, John Julius. The Other Conquest. Harper & Row Publishers, 1967. “Sichelgaita.” Foundation for Medieval Genealogy. Southern Italy, G. PRINCES of SALERNO 981-1072 (FAMILY of LAMBERT) GUAIMAR di​ Salerno, 8. SICHELGAITA. Web. 19 June 2014. //fmg.ac/Projects/MedLands/SOUTHERN%20ITALY,%20PRE-NORMAN.htm.